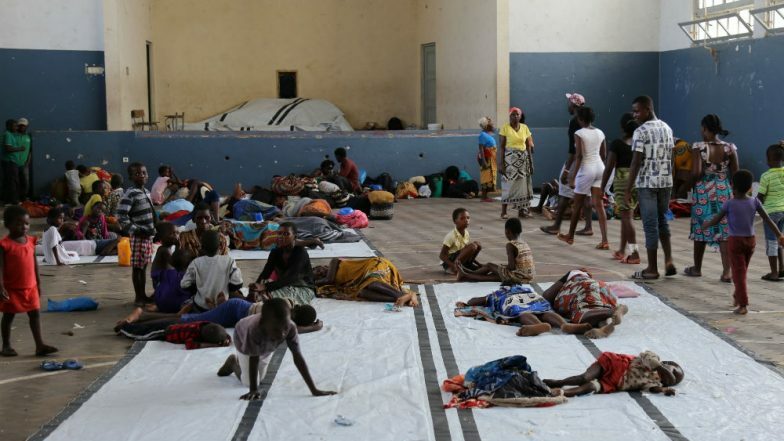 Beira, March 24: The death toll in tropical cyclone Idai-induced floods in Africa have left over 700 dead in several areas, with 417 in Mozambique alone. The cyclone and floods around southern Africa that have left thousands in desperate need of help, scrambling for shelter, food and water, while governments and aid agencies have been rushing in help. The African government on Saturday said that over 1,500 have been injured and more than 89,000 have been displaced due to the floods. The numbers are expected to rise, Minister of Land and Environment and Rural Development Celso Correia said, reported Chinese news agency Xinhua. Cyclone Idai: India Provides Humanitarian Assistance and Disaster Relief to Mozambique. In the wake of the disastrous situation, around 89,000 people are in shelters, and more are being rescued and evacuated. Correia informed that even the highest areas were affected by rainwater, and due to the dispersion of populations it remains difficult to gauge the number of missing persons. He added saying that it is believed that about one million people were directly or indirectly affected by the cyclone and flood situation. Some roads have been reconnected and communication has been re-established to facilitate rescue operations. Cyclone Idai Disaster Death Toll Likely to Go Above 1,000 in Mozambique, 90% of Beira City Destroyed: President Filipe Nyusi. Indian Navy continued the Humanitarian Aid & Disaster Relief (HADR) efforts in Mozambique in the wake of Cyclone Idai. Reports inform that India will send another ship- INS MAGAR to Mozambique, one of the three countries along with Zimbabwe and Malawi severely affected by the cyclone. The ship will have medicines, dry provisions, ready-to-eat meals, daily essentials, and clothing items. The ship is expected to sail in the next two to three days. "This would cater for approximately 1,000 persons for seven days. In addition, 500 kg of epidemic-related medicines and 400 tonnes of rice has also been loaded on the ship," a press statement issued on Saturday from the Ministry of External Affairs (MEA) read. Over the last several days, India has sent three ships-- INS Sujata, ICGS Sarathi and INS Shardul, to undertake humanitarian efforts in cyclone-hit Mozambique. Reports inform that the the first batch of Humanitarian Assistance and Disaster Relief (HADR) material including food, medicines and clothing reached Port Beira of Mozambique on March 20. As part of India's efforts, three medical evacuations by Chetak which rescued 181 people on March 21 alone, dropped food to the affected by helicopters, given medical aid to 563 people and provided food to around 450 people. In the last week, Mozambican port city of Beira was hit by Cyclone Idai with winds of up to 170 km per hour (105 miles per hour). The deadly cyclone then moved inland to Zimbabwe and Malawi, swamping populations and devastating thousands of homes. Reports inform that while 417 deaths were reported from Mozambique, the storm has also killed 259 in Zimbabwe, while 56 have lost their lives in Malawi. According to reports, in all three countries, survivors have been digging through rubble to search for victims.